A memoir and cookbook rolled into a beautiful package. 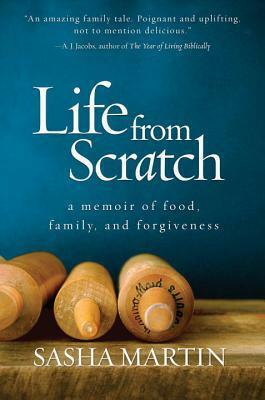 Life From Scratch gives readers a sense of how a simple connection with food can mean so much to one person. Sasha and her brother Michael were raised in a single parent home. With only their mother to care for them, they had very little. However, the trio managed to make the best of the moments they had together gathering around central structure in their tiny apartment that acted as their dining table, kitchen island, and sewing table. It was here that Sasha's fascination and relationship with food began. Her mother baked birthday apple pies, crepes and her beloved German Tree Cake. Each one of these items eliciting a memory from her past and has made their way, recipe and all into this book. For more information on Sasha Martin and her Global Table Adventure where she has "cooked the world", visit her website here. I discovered Life From Scratch via The Morning Show Book Club. Each month, Janet Joy Wilson (@jsquaredink) selects a book and is discussed on the air with the Global Morning Show team at the end of the month. Janet Joy has yet to steer me wrong! Past book club picks include: The Last Policeman by Ben H. Winters, The Life-changing Magic of Tidying Up by Marie Kondō and Mad Miss Mimic by Sarah Henstra, Learn more about the book club and past/future selections here.